Care2 Healthy Living | What is the Healthiest of All Plant-Based Milks? What is the Healthiest of All Plant-Based Milks? Plant-based milks are here to stay. In the US and UK milk consumption has dropped an average of 1 percent every year in the last 70 years. Globally, the plant-based milk market is expected to reach $16.3 billion by the end of the year—a steep rise from $7.4 billion in 2010. Each plant milk is different, especially in culinary application. Almond milk, which is thinner than soy, is a great companion for cereal and oatmeal. Rice milk can be wonderful in baked goods. Full-fat coconut is essential for creamy curries. And soy milk froths up wonderfully for lattes and cappuccinos. Detailed in a new study, researchers spent some time investigating these 4 major milks and determined that soy came out on top in terms of health benefits. The study, from McGill University and published in the Journal of Food Science and Technology, compared these unsweetened varieties and found that the anti-carcinogenic properties of soy milk’s isoflavones were a powerful draw that put the decades-popular drink at the top of the list. Rice milk was noted as a good alternative to those with dairy, soy or tree nut allergies, yet yielded little nutrition when compared to other milks. Coconut milk’s high fat content was noted, but these healthy fats can reduce bad cholesterol numbers. And finally, almond milk’s monounsaturated fatty acids were noted to help with weight loss, weight management and bringing down bad cholesterol. The arguments for cow’s milk, however, were on the weak side—especially when considered for adult consumption. Because cow milk is similar to human breast milk (duh), it can provide some helpful antimicrobial exposure for human infants, just like human breast milk. And it contains protein, fat and carbohydrates, all of which are necessary in a diet. The risk of food borne pathogens should not be ignored, however. And cow’s milk has a slew of health concerns associated with its hormonal composition, its respiratory effects, and its advertisers erroneously touting the product as the best or even only source of dietary calcium. Harvard’s School of Public Health even recommends piling our plates with plant-based calcium-rich foods and says, about cow’s milk, “there is considerable evidence that too-high intakes can be harmful”. 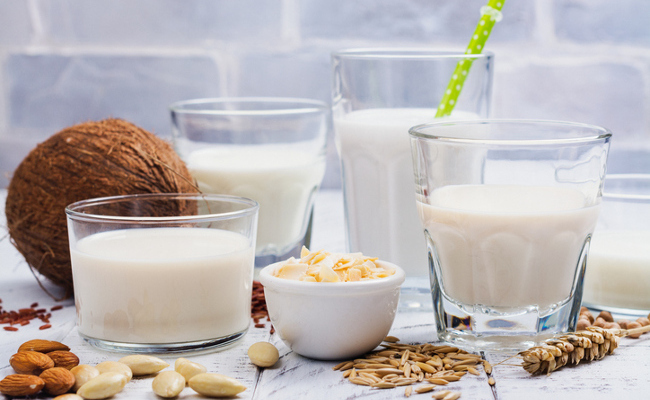 If you are curious about trying out some different plant-based milks, check out this handy guide that breaks down some of the most delicious and nutritious applications for each variety. I used to drink Soy milk only but some how have lapsed back to skim cow milk. The hard part is if you have people visit and all you have is soy milk to offer them. Great info! I just love soy mild and almond milk and they are just full of antioxidants that benefit you and can even help reduce harm cholesterol and help you to lose weight! Dairy mild on the other hand, is full of fat and increases bad cholesterol and the type of fat that just puts on weight! None of us need that. TY for this great info!